Long recognized as a bike-friendly campus — for reasons apparent to anyone attempting to cross any one of its many bike paths in between classes — UC Santa Barbara has taken that designation to a new level with the launch of a bike share program. As the pilot location, along with Isla Vista, of what is intended to ultimately be a regional bike share, UC Santa Barbara will have 600 bicycles in circulation during the fall quarter. The impending arrival of 300 additional bikes follows the initial 300-cycle deployment in August. Coming in January: 600 more, bringing the fleet to 1,200 bikes — and pushing UC Santa Barbara forward once more toward carbon neutrality and zero waste, while also expanding bike accessibility and fostering a healthier campus. “This is an incredible next move in our sustainability efforts for the campus and toward getting those last percentages we need to reach 100% in alternative transportation by our students,” said Mo Lovegreen, sustainability director for UC Santa Barbara. “This is one of those great elements that we can see both for visitors and students. We have over 40,000 visitors to campus each year and this also gives them a non-vehicle way to get around while not producing greenhouse gas emissions. 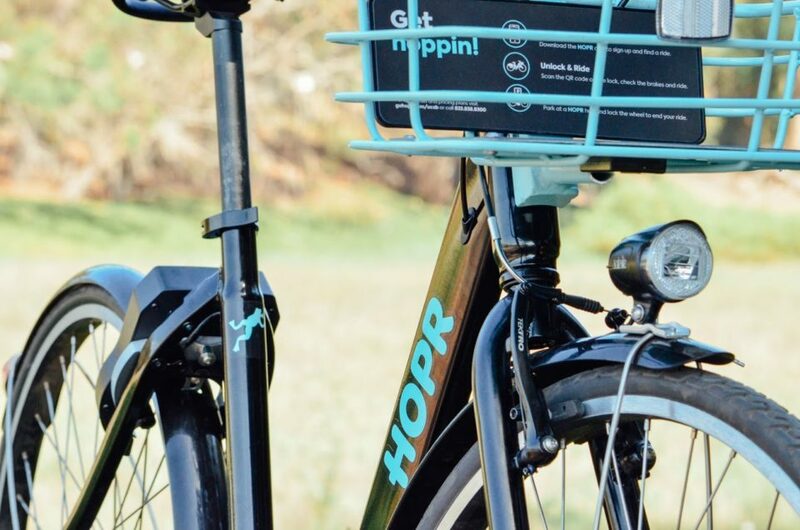 The fourth-generation “smart” bikes come courtesy of HOPR, a multimodal transit app, in a no-cost contract for UC Santa Barbara. The equipment and technology, the maintenance, the rentals and memberships, and the transportation of the bikes themselves, are all handled by the company. Riders need only to show up. To make the program even more accessible to students, UC Santa Barbara’s Office of Financial Aid and Scholarships will pay half of that cost — an annual membership runs $60 — for the first 1,000 aid-receiving students to sign up for bike share. That’s a key aspect of the program, according to Lovegreen. UC Santa Barbara has been actively working toward such a program since 2015, as a means of achieving platinum-level certification for a bike-friendly campus, Lovegreen said. Currently, 46 percent of students commute by bike between their home and campus; overall, approximately 94 percent use alternatives to single-occupant vehicles. With more than seven miles of bicycle paths, a temperate climate and mostly flat topography, biking around UC Santa Barbara — and the area in general — is “one of the fastest, easiest and most energy efficient ways to get around,” said James Wagner, who oversees campus bike share as manager of UCSB’s Transportation Alternatives Program. The campus came to serve as the pilot location by way of a South Coast Bike Share Feasibility Study developed in partnership with Santa Barbara Bicycle Coalition, the County of Santa Barbara, the cities of Santa Barbara and Goleta, Santa Barbara Waterfront, Santa Barbara City College, Metropolitan Transit District and Santa Barbara County Association of Governments.